Harrington Homes unveiled their newly completed development in Paignton – Bishops Place Apartments. Their impressive gated development of 1, 2 and 3-bedroom apartments in the heart of Paignton has demanded strong interest locally; with a number being reserved off plan. 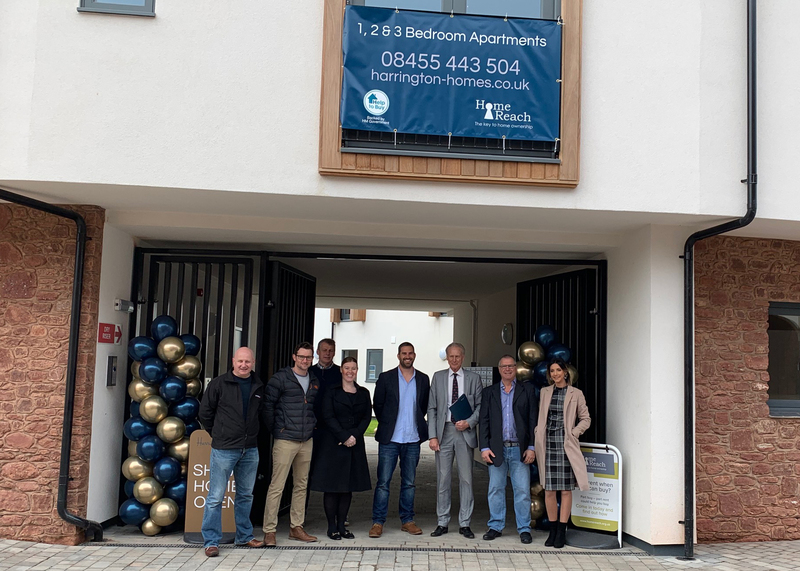 Harrington Homes Managing Director Gareth Hughes and Mayor Gordon Oliver cut the ribbon and opened the development to the public for the first time on Saturday 6th April. There was a hog roast, local ales and sparkling wines all on offer for visitors to enjoy, whilst enjoying the sunshine and atmosphere in the communal garden. There is a collection of 32 apartments offering a range of apartment styles, some of which are situated within the Victorian fronted building which has been refurbished, some of the apartments still have their pre-existing ornate features, including large bay windows, with views over the traditional coastal town, whereas others are located within the new build to the rear of the site. Each apartment has a family sized bathroom, with an open-plan kitchen, living, dining space, which is perfect for entertaining. Depending on the stage of build, customers will be given a choice of finishes in the kitchen and bathroom, allowing them to customise their new home before moving in. All apartment kitchens come furnished with a hob, oven and extractor fan. All apartments have access to a communal bike store, as well as landscaped gardens to enjoy the town’s mild climate. The apartments acquired their name by being located close to The Bishop’s Palace, a medieval building that dates back to the 14th century. The apartments are within quick and easy walking distance of the Paignton town centre, railway and bus station perfectly located close to local amenities. The apartments can be bought using a variety of buying options such as; *Help to Buy, Forces Help to Buy, Part Rent – Part Buy, Part Exchange and Assisted Move. Apartments are for sale from £67,725. *When purchasing a 50% share of a property valued at £135,450 the share is £67,725, shares available up to 70%. All schemes are subject to meeting qualifying criteria and availability.